Mommy I want Santa to bring me that, Boots said as an Easy Bake oven commercial aired. I ignored him, because Boots wanted virtually everything he saw on TV or in an ad this year. 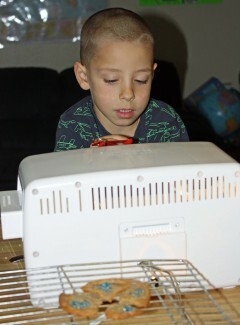 But when he went as far as to write Easy Bake on his official letter to Santa, I knew there was no avoiding it. And I hated that for reasons that have nothing to do with gender stereotypes. I don’t care if the guys cook and bake – in fact, I’ve long encouraged it. But I just didn’t understand the need for an Easy Bake when they were free to don their aprons and climb on a stool anytime the real oven was fired up. Plus I had a feeling that Easy Bake would be a food allergy headache, and I was right. In addition to the fact that most mixes contain egg, they also carry nut warnings. Having to bake from scratch pretty much takes the “easy” out of Easy Bake. Still, he kept insisting so I caved. It turns out it was the right thing to do. It took us until two days after Christmas to give Easy Bake a try because I couldn’t find the required 100-watt light bulb on post. I couldn’t find it in civilian land either, for that matter, and had to settle for a 95. It worked but prolonged the agony … I mean, the baking time. That simple statement sent me spinning back to childhood, when I, too, had a set “all my own.” I was more of a Suzy Homemaker kid, and I had the complete line except for the iron. Maybe that explains certain appliance aversions that extend to this day. He learned to measure shortening, flour and sugar. He identified the 1/8 teaspoon for the cream of tartar and baking soda. He wasn’t able to get the dough mixed by himself, but blending shortening is a fairly advance culinary skill. He rolled the dough into balls and patted them gently, adding colored sugar before handing the pan over to me to slide into the oven. Then he waited, very patiently because the 95-watt bulb and chunky patties meant it took each tiny pan 13 minutes to bake. I managed to not point out that we could have baked a dozen cookies in the big oven in that time. I still said “no” to Moon Sand this year, but I’m glad I gave in on Easy Bake.